Last Valentine nAPO Nila kickstarted APO Hiking Society's series of farewell concerts as the group officially retires this year. I believe it will be a series of 16 or so concerts all over the country and some places abroad, the last of which will coincide with the May elections at the Araneta Coliseum. That is what I heard, though I have yet to find their schedule. Hehe. 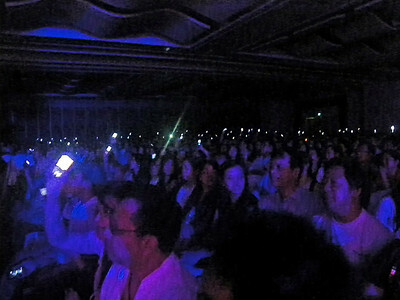 The Valentine concert was held at the SMX Convention Center. And though the place is new and accessible and prestigious, ambiance-wise, I will really think twice about going to a concert there again! The concert was in Function Room 3 and 4, I think, which was basically a rectangular room and they set up the stage in the center of one of its longest walls. So those with the cheaper tickets had to depend largely on a video wall. Heck, we were GOLD ticket holders ourselves but had to be content with mostly Jim Paredes on stage (because several things were obstructing our view) or watching from the video wall. And we were seated at the second row! I think Music Museum would have been a better venue (but it would probably be smaller or more expensive, I don't know). It was amusing to see folks in their 40s to 60s, some of which were dressed to the nines, some of the women wearing gowns, formal wear, pearls. Then again, APO Hiking Society has a 40-year strong musical legacy. It was also amusing to see young people (youngest I saw was probably ten years old) tagging along with parents and grandparents, looking bored during the one hour delay. They said it was a 5,000 crowd. The great thing was, since it's APO Hiking Society we went to watch, the crowd was mostly made up of educated and well-bred folks. Otherwise, the one hour delay could have resulted in a really boisterous crowd. Plus, since the event organizers/ushers sucked big time (I don't know who to blame, not just for the technical difficulties, but for the lack of proper signs directing people to the right lines, for the change in seat layout), it was a blessing that the most people did were frown and ask sarcastic questions in a mild manner. The only celebrities I saw were Mike Enriquez and Rajo Laurel (who had the unfortunate luck to be seated in front but to the right of the stage, with several stage props blocking his view of the stage, and a weird angle hindering him from really enjoying the video wall). I believe a lot of people came in families as well. They must be family friends of the group or people who thought it's a great thing to go to as a family. Kaye Brosas served as front act, opening the show in a wedding dress. I love her, toilet humor and all. Plus, she really has an amazing voice! It felt like I was in a comedy bar though and the Mom in me couldn't help but worry about how parents felt, having their kids hear certain language and such humor from Kaye. 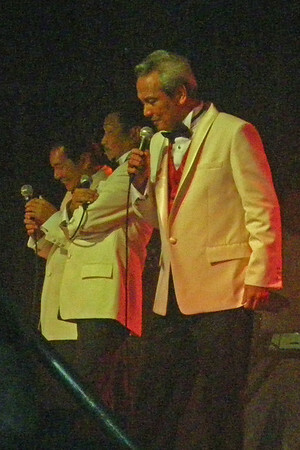 The concert lasted for three hours, with APO Hiking Society performing nonstop for two and a half of it. In all honesty, I felt exhausted for them! But it was a great show. They sang many medleys and I loved that part where they sang old folk songs in modern ways. They also sang Kabilugan ng Buwan in marching band, rock and roll (Elvis) and Latin (America) style. They sang their old songs I heard there for the first time. 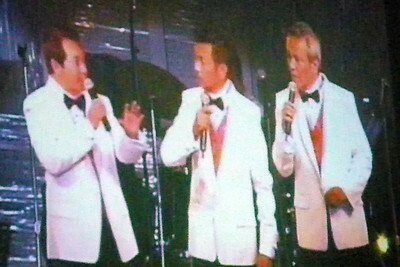 They sang songs I love, usually in medley. But I love that they sang the entire PANALANGIN song because it was one of the songs we used at my wedding. They also unabashedly supported and promoted Noynoy Aquino's bid for the Presidency with a song (Mr. Suave, "Noynoynoy, Noynoynoy") and lambasted all the others in a funny song they made up. And in between, they engaged in hilarious repartee. Many times, I felt emotional, feeling for those in the crowd who grew up with their songs... and feeling for them who are bowing out with grace. They ended the night with MAGKAYAKAP SA DILIM. I was clapping all throughout the concert and laughing out loud. It was really a great show. It felt very intimate too. 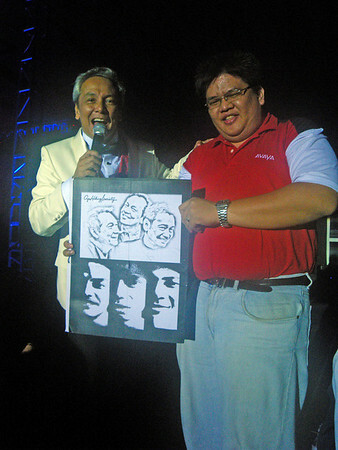 It showcased what made them the APO Hiking Society... great songwriting, classic melodies and true emotions. And an ability to grow with the changing times. Indeed, THANK YOU FOR THE MUSIC, APO HIKING SOCIETY. I strongly encourage everybody to catch the rest of their shows. maganda sana yung concert, almost perfect. but the venue, was a big thumbs down hehehe. tawang tawa ko dun sa mga explanation nila ng "medley". lalu na yung kay buboy. hahaha.